When a vengeful sorcerer unleashes a Fire Demon to destroy his rivals, he sets off a chain of events that will eventually destroy Gol, a war-torn continent at the other side of the world. Unaware that time is running out Gol’s scheming barons overthrow their king and strive to seize control, unleashing a bloody civil war. Two young lovers find themselves caught in the web of murder, treachery, and sword and sorcery threatening to destroy their existence. Lissane, a baron’s daughter and Erun Cade, a commoner, plan to flee Gol before its foretold ruin. However, the Baron already has plans for his daughter and sends his brutal sons to deal with her lover. 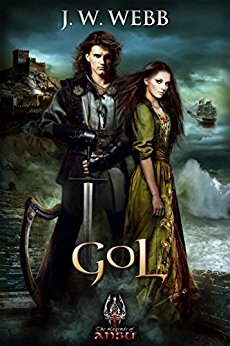 Gol mingles, mystery, myths, and legends with gritty action and snappy dialogue, woven to an epic tapestry of dark fantasy.